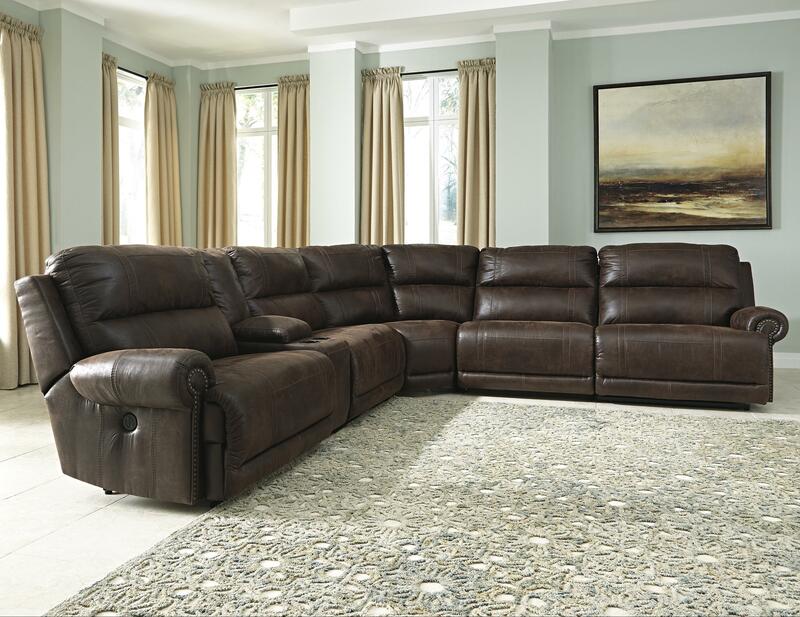 Covered in brown faux leather upholstery, this spacious sectional has the ultimate combination of comfort and style with a storage console, wedge, reclining ends, and armless recliners. 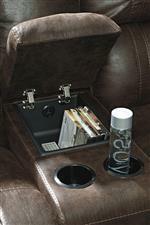 The storage console has two cup holders, plus a lift up cushioned armrest that reveals a storage compartment with built-in USB charging. Each end of the sectional reclines, plus two armless recliners recline via a concealed parachute handle so that you can unwind at the end of a busy day. For relaxing or hosting guests, this sectional has all that you need. The Luttrell 6-Piece Reclining Sectional with Console & Armless Recliners by Signature Design by Ashley at Michael's Furniture Warehouse in the San Fernando & Los Angeles area. Product availability may vary. Contact us for the most current availability on this product. 9310157 Console with Storage 1 13" 40" 43"
9310141 RAF Zero Wall Recliner 1 46" 40" 43"
9310119 Armless Recliner 2 37" 40" 43"
9310177 Wedge 1 71" 38" 43"
9310140 LAF Zero Wall Recliner 1 46" 40" 43"
Footrest Operation Exterior handle for end recliners. Armless recliners recline with parachute handle. Create the sectional that you have always longed for with this collection. Each piece is covered in a versatile Espresso brown color. You can choose from standard or power recline for the ends of the sectional. Additional pieces available include a storage console with USB chargers, wedge, stationary armless chairs, or armless reclining chairs. 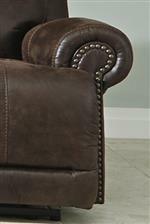 The Luttrell collection is a great option if you are looking for Casual furniture in the San Fernando & Los Angeles area. Browse other items in the Luttrell collection from Michael's Furniture Warehouse in the San Fernando & Los Angeles area.